This hose is used in similar applications as our regular push-on, but is MSHA approved for underground mining and has an ultra-abrasion resistant cover (it is also available in the 1" size whereas the NL515- listed above is only available up to 3/4"). It provides greater durability over regular push-on hose in abusive environments. Typical Fittings: Brass N68011 or stainless "Push-On fittings" which are specifically designed for use on "Push-On" hoses up to 300 psi (do not use on any other type of hose). When used with Push-On hose, the defined barb on the fitting and the special hose reinforcement will provide sufficient grip thereby eliminating the need for any hose clamps. 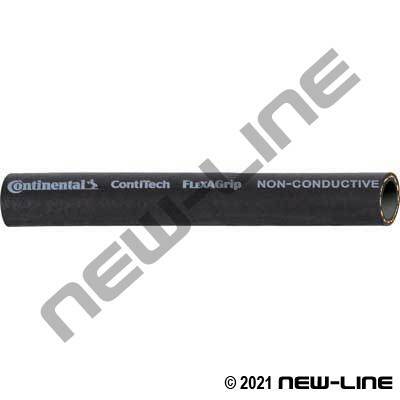 Construction: Tube: Black seamless, Chemivic rubber. Cover: Black Carbryn rubber. Reinforcement: One textile braid (specially angled for push-on fittings).